The skeleton of the South African reptile, Eunotosaurus africanus, fills a gap in the early evolution of turtles and their enigmatic shell. It’s a question so obvious a schoolchild can ask it, but for more than a century, consensus has eluded the paleontologists and evolutionary biologists who study the reptiles and their bony carapaces. Now, a group of scientists at Yale University and the Smithsonian Institution argue that a reptile fossil that’s been gathering dust in museum collections is actually a turtle ancestor, and that its reduced number of ribs, distribution of muscles, and T-shaped ribs could help settle the question once and for all. In a new paper published Thursday in the journal Current Biology, they unveil the argument that a 260 million-year-old creature called Eunotosaurus africanus was a turtle ancestor, hoping to help resolve a debate that has split the scientific community for decades. The ink spilled so far has roughly divided the scientific community in two camps. On one side are those who believe that the turtle shell came about as external bony scales, similar to the ones found on armadillos or certain lizards, fused together with the reptile’s internal rib cage. On the other side are those who believe that reptiles’ ribs instead began to broaden until they eventually formed the bony protrusion that is the shell -- mirroring the way that turtles develop in the egg. The 260-million-year-old Eunotosaurus supports the second interpretation, showing that an animal without external scales had broadened ribs. The new paper won’t, by itself, settle the question, outside scientists said. Kenneth Angielczyk, a paleobiologist from the Field Museum in Chicago, said that the paper provides a “useful working hypothesis” and is a valuable synthesis of data from two different fields. The new paper revives an old idea. In the late 19th century, Angielczyk said, scientists first speculated that Eunotosuarus might have been an early turtle. The idea never caught on, floundering in the face of the limited evidence from the fossil record. For a long time, the oldest known turtle was a 210 million-year-old specimen that had a fully developed shell and had bony plates on its neck and tail, Lyson said. It wasn’t much of a leap for paleontologists to think that early turtles must have developed through a two-pronged process, in which external scales had fused with its internal bone structure. 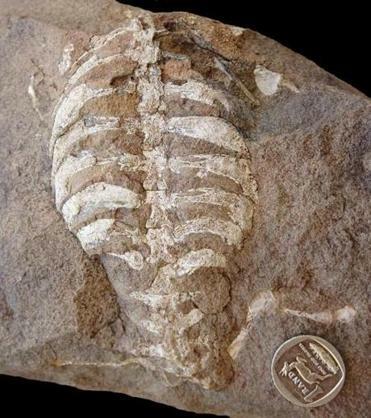 Meanwhile, however, developmental biologists studying how turtles grow saw the opposite occurring -- the ribs broadening out and fusing together to create the shell. For years, the field was at an impasse, Lyson said. Then, five years ago, a new early turtle species was discovered in China, called Odontochelys semitestacea. That species had a belly shell just like a turtle. It had no external scales on its body. But it did have distinctively broadened ribs. “It released us from this self-imposed constraint,” Lyson said, where paleontologists were all looking for turtle ancestors with hard external plates called osteoderms. That suggested to scientists that they should take more seriously the idea that the turtle got its shell as its rib cage and spine broadened. But even so, that new species left a 40 to 50 million gap in the fossil record, during which scientists still knew little about the development of turtles. “What could help fill this gap?” Lyson said. He traveled to South Africa to study fossils of Euntosaurus in museum collections and began to realize that this creature might help fill in the blanks. It had a backbone and ribs that seemed potentially transitional between a reptile and turtle. It had broadened, T-shaped ribs and a shorter torso, with one fewer set of ribs than lizards. He began to craft his argument, doing studies that included close study of the bones to see where muscles would have been attached and examining in cellular detail the fossils. Angielczyk said that big questions remain. Genome studies have suggested that turtles are closely related to lizards, he said, whereas the current data support another persuasive idea, that turtles are the only extant members of a group called Parareptilia. “Obviously only one of these scenarios can be right, so a next step will be to try to figure out which one it is,” Angielczyk said.